The U.S. Patent and Trademark Office published an invention today that suggests the next Apple Watch could identify its owner simply by checking their heart rate. Apple's patent application is titled "User identification system based on plethysmography" and describes how a pulse oximeter is used to determine the biometric signature of a user's cardio rhythms. This data could then be used to identify the wearer and unlock the watch in a manner similar to Touch ID on the iPhone. The system works similarly to existing monitors, by projecting light on the user's skin and measuring how much of it is absorbed and reflected back to the device. The measurement can then be used to determine the amount of blood present in the vasculature. According to the patent, the data gathered by the two photosensors is either stored or compared against previously saved information to positively identify the user. In an associated patent also published today, the invention is extended to take in data from motion sensors like accelerometers and gyroscopes to determine user movement. Certain gestures, for example raising the device from waist height to head height, trigger the authentication process. AppleInsider notes that the system could replace Touch ID during Apple Pay payments and further reduce the watch's reliance on iPhone, although it's unclear if heart rate data can be a unique enough identifier to ensure the same level of security. this is just NOT possible. Your heart rate can change a lot in many normal and abnormal conditions. I call this BS. What this sensor measures is how you blood vessels expand as a pressure pulse is travelling through your veins when the heart contracts. The blood pressure (and thus the size of the blood vessel) follows a periodic fluctuation not unlike a sine curve. The heart rate is given by only looking at the frequency of that periodic fluctuation. Studying the whole shape of the curve gives you much more information than just looking at the frequency. Is it that your holding off until the security parity between heartbeat signatures and fingerprints is closed, or do you honestly not believe it is a viable identification technique? The way I read you posts you seemed to dispute that heartbeat signatures are unique. Am I misreading your objection? Troll trap! He's got you doing his research for you! Meanwhile he just sits back and armchair reacts to your posts. Is it so important to get this guy to agree with you that you have to do his work for him, given he's not intellectually curious enough to do it for himself? That's deliciously clever technology. The Star Trek future gets ever closer. You would be amazed at the technology our secret space programs keep from us. Stuff we already have, things us normal people won't ever get to experience. It's nowhere near as individual as a fingerprint. And fingerprints don't change moment-to-moment depending on your breathing, activity, and environment. Yeah, something not adding up here...! You don't understand micro palpitations do you? The way your heart operates doesn't change moment-to-moment. Yury: I didn’t realize that people’s heartbeats are different. Is the heartbeat really a reliable biometric? D’Souza: Yes, it is! Everybody’s got a unique heartbeat. It’s based on the size and shape of your heart and the orientation of your valves, your physiology. It doesn’t change unless you have a major cardiac event like a heart attack. Yury: What about when you’re nervous and your heart rate goes up? Will it still work? D’Souza: Your heart can beat faster but electrically your beats look the same. So, whether it beats faster or slower, it doesn’t really matter. It’s really about the shape of the waves, and what that signal looks like when it comes off your heart. No, my objection is that there is no way this currently works when scaled up to a decent population size, which is of course what would be required for this to be an identification technology. Did you read those papers, or did you just quickly google, then cut n paste? "..the majority of the studies have been conducted on a small population (about a few tens of subjects). Therefore, the applicability of ECG biometric recognition on a large scale (real life authentication scenario) it is not yet proven." "..almost all studies (except for [17 ('https://www.ncbi.nlm.nih.gov/pmc/articles/PMC4535678/#CR17')] and [31 ('https://www.ncbi.nlm.nih.gov/pmc/articles/PMC4535678/#CR31')] ) ignored the variability of the ECG during life span (i.e. variability induced by work, ageing, iterate sport activity etc. ); moreover, only few studies [57 ('https://www.ncbi.nlm.nih.gov/pmc/articles/PMC4535678/#CR57'), 83 ('https://www.ncbi.nlm.nih.gov/pmc/articles/PMC4535678/#CR83'), 136 ('https://www.ncbi.nlm.nih.gov/pmc/articles/PMC4535678/#CR136')] considered the applicability of these techniques when subjects suffer from pathological conditions. ECG recognition in pathological subjects is another aspect worth of additional investigations." "it must be emphasised that, while guidelines are available for ECG acquisition in the clinical scenario, there is still a lack of standardisation on ECG acquisition (number of leads and their positioning, sampling frequency, number of bits, filtering, type of electrodes, number of leads etc.) for biometrics applications. However, ECG databases for biometric recognition should ideally include recordings, at a given sampling frequency and conditions, from the same subjects in different circumstances (e.g. relaxed, during and after physical training) and along a period of several years." And still no discussion of sensitivity and specificity. Not even remotely close to being a practical and usable technology. But your heartbeat signature is unique. This isn't about heart rate, it's about the extremely minute differences in how every persons heart beats, it's as identifying as a fingerprint. 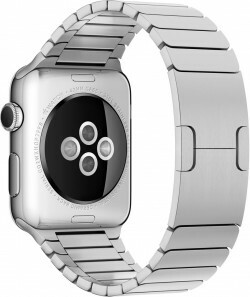 AppleInsider ('http://appleinsider.com/articles/16/10/13/future-apple-watches-might-use-heart-rate-sensor-to-identify-owner-feature-wrist-gesture-control') notes that the system could replace Touch ID during Apple Pay payments and further reduce the watch's reliance on iPhone, although it's unclear if heart rate data can be a unique enough identifier to ensure the same level of security. I see no way this reduces the watch's reliance on iPhone. Please explain.